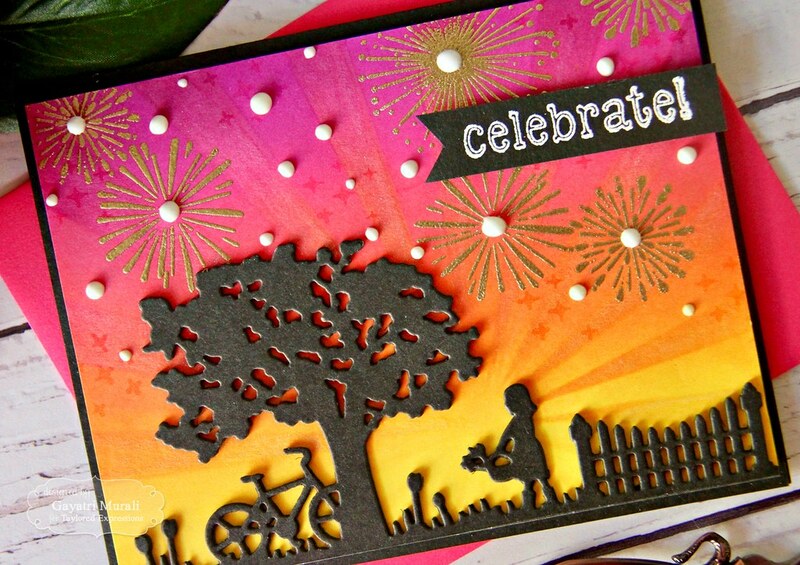 I have a celebrate card using Taylored Expressions to share with you today. I wanted to do a layered background using an older border die from Taylored Expressions. When this die called In the Garden was released, TE didn’t have their own matching inks or stencils. 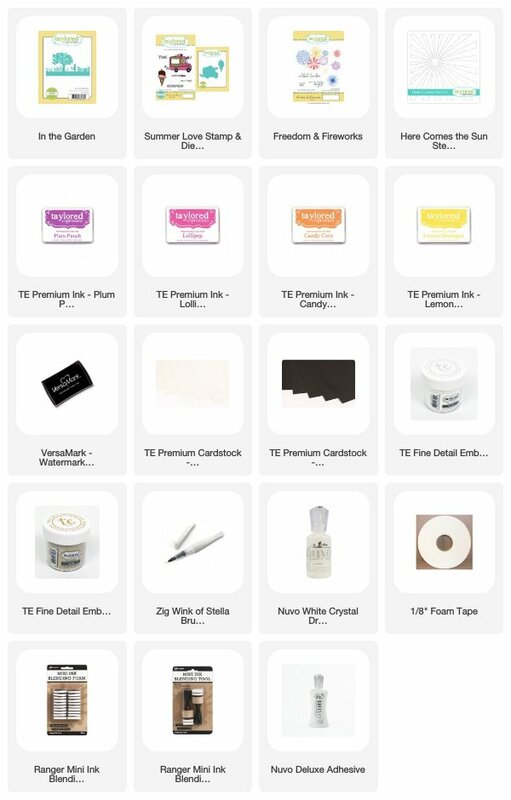 But now TE has gorgeous dye inks coordinating their cardstock colours and lovely stencils. So I wanted to revisit the older die using some of the new products. So I sponged a white panel with TE Lemon Meringue, Candy Corn, Lollipop and Plum Punch inks to create a sunset scene background. 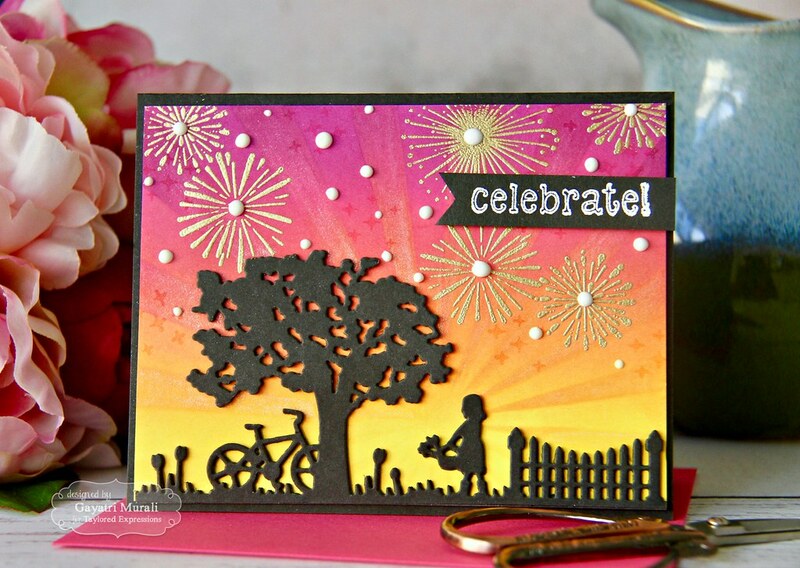 Then I layered the background with Here Comes the Sun stencil and sponged the same inks but this time heavily. TE inks dry down and softens. So don’t worry about the heavy application over the stencil. The inks will soften and give a subtle sun rays on the background panel. I brushed the rays with clear shimmer. I trimmed the background panel to 4’x5.25″. 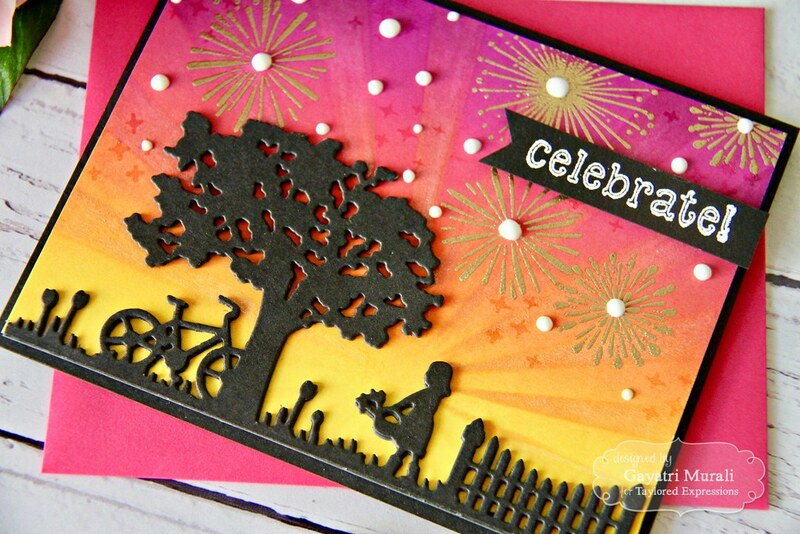 Then I stamped and gold heat embossed the firework images from Freedom & Fireworks stamp set on the panel. I also stamped one of the images from the stamp set using versamark for subtle layering. 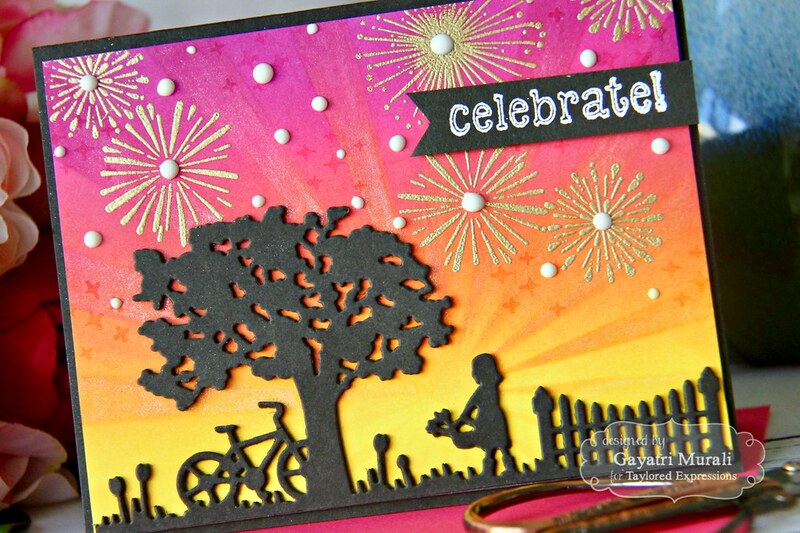 The silhouette die cut is made using TE’s In the Garden border die. I die cut this die using Oreo cardstock three times and stacked glued them for added dimension. I adhered this stacked die cut on the bottom of the background panel. Love the contrast of black silhouette against the sunset background. I adhered this panel on an Oreo card base. 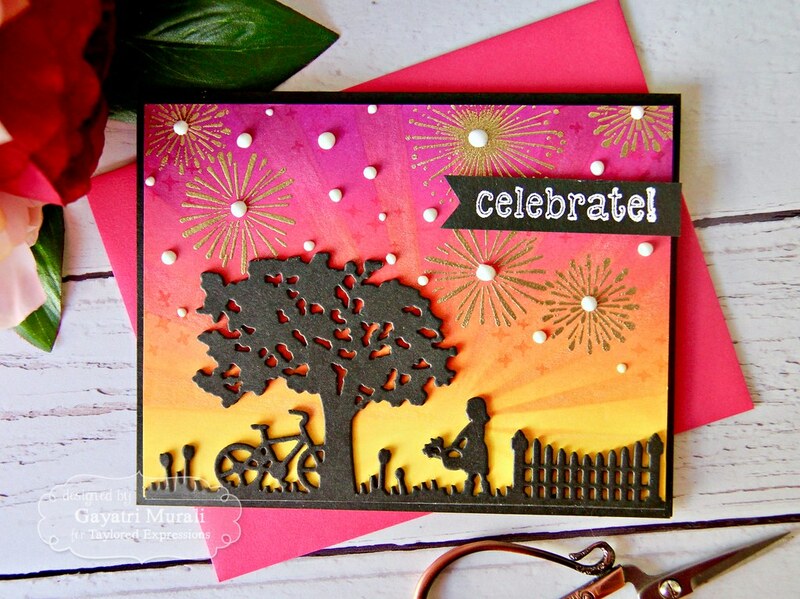 The sentiment is from Summer Love stamp and die combo. I white heat embossed this sentiment on a strip of Oreo cardstock, trimmed a fish tail end and adhered on the top right of the card front using foam adhesives. Then the white sentiment was the odd one out on the whole card. So I brought in more white into the card using white Nuvo Crystal Drops. I added lots of them randomly and also on the centre of the fireworks. The background turned out lovely. Lots of layering on it. The ink blending, ink sponged on stencil, the heat embossed fireworks, shimmer on the rays and the white Nuvo drops. The contrast from the black base, silhouette die cut and sentiment is great. I really love it. Hope you are too.